If you want your artwork to turn out great, then you must handle it like a professional: do not hang it up using thumb-tacks because that will poke holes in it. Instead, use the MagneTack, a magnetized poster and photo hanger that let you display your work easily without any damage. You simply place one piece of the magnet into the mounting surface and the second piece over the artwork and your work is safely held in place. You can simply place the magnets into the bulletin board or wall by hand. Moreover, they are movable and reusable! That sounds amazing! Stick the base tack in the cork-board or wall. Place your artwork over the base tack. 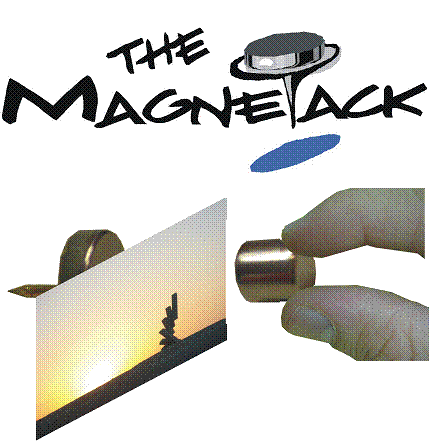 Place the coupling magnet over your artwork so that it is sandwiched between the two magnets. 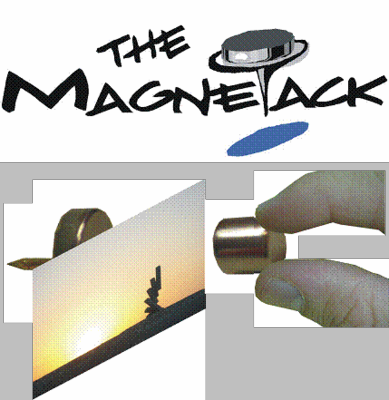 The MagneTack is manufactured using Neodymium, Iron and Boron, which form rare-earth magnets. This makes it a permanent, extremely durable, but super light magnet so you do not have to worry about buying a new set often. The magnet ensures that you do not leave any poke holes in your artwork! There is no sticky goo! You do not rip your work using tape! What Benefits do Magnetacks Offer? You can stick as many as 25 business cards without much struggle! Have you just finished a great piece of artwork? Do not spoil it with tape or other stickers that will poke holes into it: hang it up using Magnetacks! Magnetacks are Super Strong Magnets! They can support up to three quarters of weight! No damage to the artwork!